"We found that drones can be used to count and make species-level identifications of marine species, particularly in shallow marine environments," says Enie Hensel, a Ph.D. candidate at NC State and first author of a paper on the work. "Demonstrating the viability of drones for this work matters, because these are inexpensive tools for collecting accurate abundance estimates," Hensel says. "And those estimates are important for both informing the development of conservation efforts and for assessing the effectiveness of those efforts. "Drone surveys are also a good way to monitor shallow water, megafauna species because they are not intrusive," Hensel says. "More traditional monitoring methods – such as boat surveys or gill nets – are more invasive, and have the potential to harm individuals or alter their movement patterns." "We chose grey shark decoys because they would be the most difficult to spot in these environments, but we were able to spot them all," Hensel says. "One reason we chose these sites, all of which were on Great Abaco Island in The Bahamas, was because The Bahamas are interested in using several of the sites as a pilot for a managed conservation effort," Hensel says. 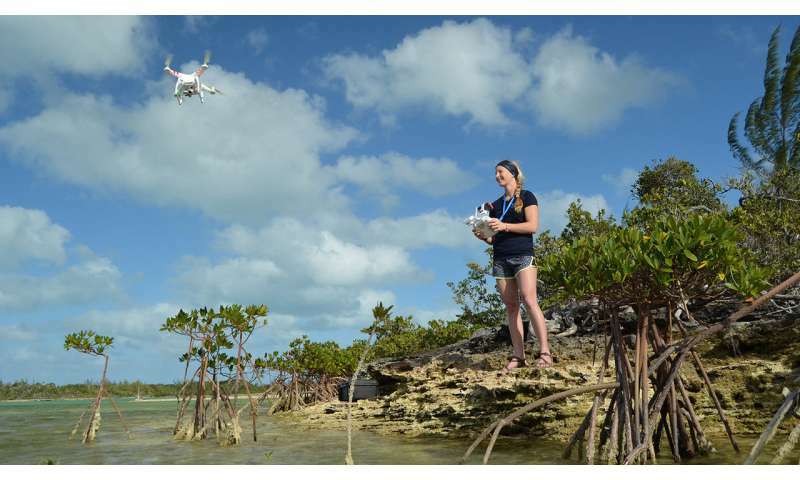 "Our surveys provide baseline data for marine megafauna abundances within these newly established parks and we show that drones offer a new management tool for the park service of The Bahamas. And, of course, the technology certainly opens doors for us to explore a range of conservation issues." The paper, "Using a small, consumer-grade drone to identify and count marine megafauna in shallow habitats," is published in the Latin American Journal of Aquatic Research.